Built in the 1920s, Gladstone Manor was designed to have the appearance of a small English village. The neighborhood, affectionately known at “The Manor” by its residents, is located at the western end of Lansdowne. Lansdowne is a borough in Delaware County, Pennsylvania, located 5 miles southwest of downtown Philadelphia. It was named for the Marquess of Lansdowne. The borough grew quickly in the early part of the twentieth century when a railroad stop was established near the intersection of Lansdowne Avenue and Baltimore Pike. The development was originally located on the site of Gladstone Hall and its grounds. Gladstone Hall, no longer in existence, was one of the most impressive homes in the Philadelphia region in its time. It was built for Charles Kelly, owner of the Kellyville Mill located along the Darby Creek below the hill on which the house was constructed. After being used as a community gathering spot for a number of years, the house was demolished in 1935. In Gladstone Manor the streets are laid out in a gentle, curving pattern and the homes are built using various design models. The English theme is evident in the use of slate roofs, gates, small gardens and stucco exterior walls with half-timbered detail. The neighborhood features specially designed streetlights, as well as a simple innovation that has the telephone and electric lines crossing the neighborhood in the rear of the properties rather than across front yards. In 1992 the GGCA celebrated its 65th anniversary by compiling a history of the Manor. The following features highlights from the 1920s. Watch for the posting of subsequent decades. 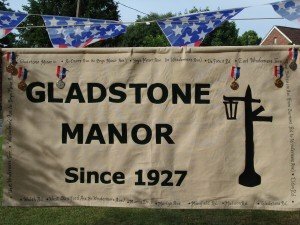 On November 21, forty-three residents held a meeting at the Mansion House and voted to form an organization called the “Gladstone Manor Civic Association.” Edward Stenz was appointed acting Chairman. The first Christmas party was held; Warren Fallows portrayed Santa Claus. The organization grew to 73 members, representing over 50% of residents. Mrs. E. G. Cheesman became the first woman member. The first motion regarded installing a fence along the railroad track. The builder of the neighborhood, W. Percival Johnson, constructed two tennis courts on the west side of the present Mansfield Road. A tennis club was organized. Increased police protection resulted in a policeman on duty twenty-four hours per day. The association requested the trolley company instruct its drivers to sound a whistle when coming up the hill to the Manor stop. The Ways and Means Committee arranged for ladies to hold a card party fundraiser. The first Christmas Eve carol singing took place. Prizes were awarded for the most artistic Christmas lighting of homes.